$102.5 (4 bids) 6 King Richard Sterling Silver 7 1/4” Dinner Forks Towle Gorgeous Condition! $51.0 (2 bids) 2 Lily by Whiting Sterling Silver Dinner Fork 7 5/8"
$38.0 Pierced Sterling Silver Salad Serving Fork spork with "g" monogram 7 1/4"
$49.99 (1 bid) 4 Lily by Whiting Sterling Silver Regular Fork 6 3/4"
$105.0 HESTENES NORWAY 925 STERLING SILVER SALAD SET ~ FORK & SPOON ~ HIGH QUALITY! $49.99 (1 bid) 3 Lily by Whiting Sterling Silver Regular Fork 6 3/4"
$19.99 (1 bid) 6 King Richard Sterling Silver 6 1/2” Desert Forks Towle Gorgeous Condition! 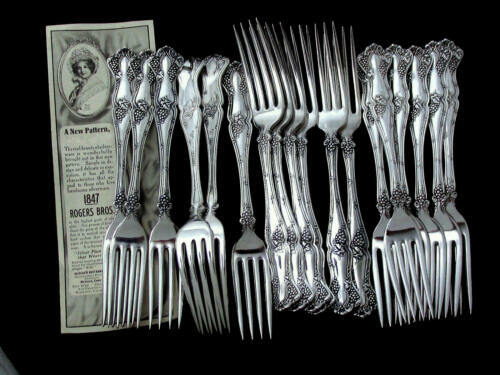 Buy: $40.0 12 Vintage Community Silver salad forks by Oneida, great condition! 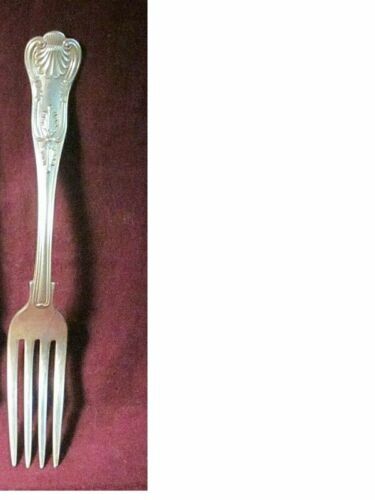 $49.99 Wilson Co STERLING Silver Kings Pattern Dinner Fork! Has Mono! 50g LOOK!